It’s my supreme pleasure to relate to you my thoughts on Minneapolis-based Bumpy Records’ two newest releases (set to drop on March 29) — “Durn Fool” by Oyster World and “Frisbee” by The Miami Dolphins. 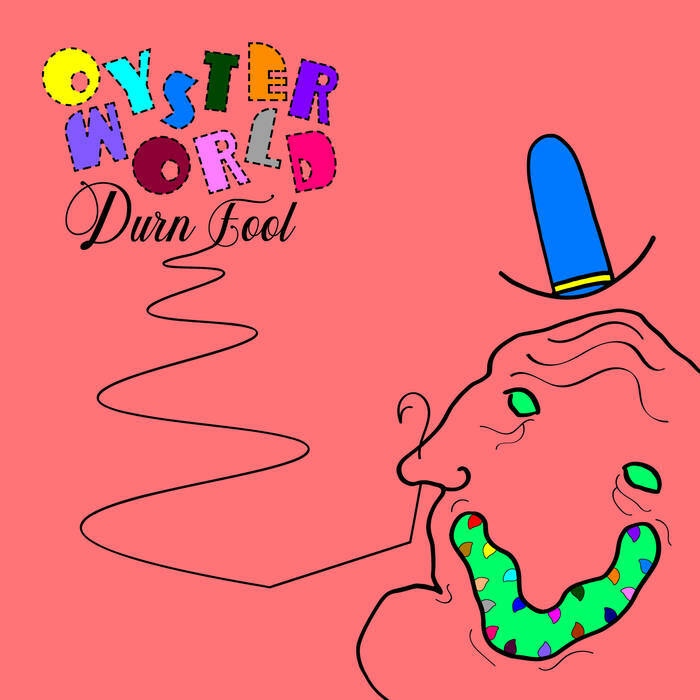 Oyster World’s “Durn Fool” is an experience — and I don’t mean that in the usual vague sense employed by those who can’t find the right word to describe an album or a movie or an actual real life…experience. What I’m saying is that this album truly is an excursion, a spastic tour across numerous genre-bending soundscapes. Think paradoxically noisy/melodic progressive punk rock infused with creative nods to the likes of Bikini Kill or the B-52s or even contemporary peers Guerilla Toss. Stephanie Jo Murck’s quirky and far-reaching (in terms of both pitch range and creativity) vocal prowess is mostly responsible for these comparisons. Much – but not all, of course – of the personality of Oyster World emanates from Murck’s musings regarding things from the mundane (such as food) to the most oft-debated sociological issues of the modern age (such as gender identity). Guitarist Matthew “Gravy” Graves’ riffs work tirelessly to provide expansive context for Murck’s vocal efforts. Expert pedal utilization and a seemingly insatiable melodic vision often propels “Durn Fool” far past telescopic range. Some of the sounds he is able to achieve are borderline extraterrestrial. Couple this with his mangled time signatures and abrupt yet effective starts and stops, and it’s definitely fair to say Graves exists in the top tier of contemporary prog guitar purveyors. Bassist Theo Pupillo is able to simultaneously compliment Graves’ guitar work while existing freely in their own sonic playground. I find it to be a very easy and pleasurable experience taking turns focusing on each players’ interwoven passages — where the bass will seamlessly assume lead melody duties or at the very least lay noticeable and catchy groundwork. Willem Vander Ark is my new favorite contemporary percussionist. I have always appreciated drummers who know when to go nuts and when to refrain. He very obviously possesses a strong compositional sense and subsequent control that breeds dynamic and continuously surprising music. Anyone who’s been in a band knows that percussionists of this caliber are not exactly common. Altogether, “Durn Fool” is abundant in jarring yet fluid musical breaks that constantly remind you that you’re listening to an unbelievably tight band — one that I imagine is amazing to see play live. The coherency that exists between the members’ individual styles almost seems too good to be true. Releasing alongside Oyster World is the short but memorable “Frisbee” by The Miami Dolphins — also denizens of the Twin Cities. The songs that comprise “Frisbee” are vast and far-encompassing despite the fact that the longest song clocks in at 4 minutes and 35 seconds. It’s almost like dream time — where a subconscious sequence that seemingly lasts for hours in one’s mind really only spans a few minutes or so in reality. Genre-wise, these songs are hearty, lo-fi post-punk/no-wave concoctions that in some ways harken back to Sonic Youth’s fledging noise days (back when they were unheard of and sorely unappreciated in the NYC scene). What sets The Miami Dolphins apart, though, is the active chemistry between the members of the band. There’s an occasional back and forth between vocalist Beth Bambery and guitarist Patrick Larkin that lends a sort of dramatic quality to the music — these moments reminding me of zany scenes acted out by two actors in a late night improv class. However, despite the surface-level stream-of-consciousness execution of this banter, it’s apparent that it’s all well-rehearsed and imperative to the overall sound of “Frisbee”. The opening title track is the standout track to me (if I had to pick one) — being that it’s the most sprawling and synecdochical of the bunch. It contains the aforementioned bizarre vocal exchanges, time signature shifts, guitar work that ranges from cheery to hyper to dissonant, and a queasy sense of structure. And what I mean by that is that control is most definitely present in all of these songs, but it’s fleeting. Each track dangles from a string over a bottomless pit of uncertainty and (in some cases) madness. I mean this in the most positive sense possible. “Frisbee” is unapologetically weird and intriguing. This entry was posted in Uncategorized and tagged tony. Bookmark the permalink. Follow any comments here with the RSS feed for this post. Both comments and trackbacks are currently closed.